Can you imagine if symbols of success were to actually trigger the fears of failure? “I was just lucky, and now they’re going to find out." What’s common between Maya Angelou, Tina Fey, Charles Darwin, John Steinbeck, Neil Gaiman, Emma Watson, Sheryl Sandberg, and Meryl Streep? Yes, they are phenomenally successful, but they also feel like, “I can’t do this, today will be the day they find out I’m a fraud!" 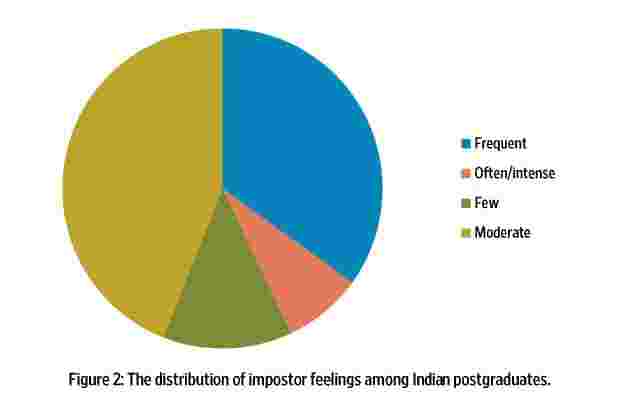 Discussions about this feeling, commonly known as Impostor Syndrome, have gained a lot of momentum in popular culture, forums about academic experiences as well as op-eds and blogs on education and management. The correct usage of the term is, however, Impostor Phenomenon, and not syndrome, as it is not an official medical diagnosis. Impostor Phenomenon describes the situation wherein high-achieving people find it hard to believe that they deserve credit for their achievements. They feel a sense of “intellectual phoniness", that is, they remain convinced that they are frauds, and soon everyone will figure this out. Despite meeting objective criteria for success (for instance, earning degrees, scholastic achievement and recognition from colleagues and authorities), those with impostor feelings find it hard to believe that they are intelligent or worthy of the accolades. In fact, they think they were simply lucky. One of the explanations for this phenomenon is that those with impostor feelings think that those who succeed are naturally competent and do not have to work hard. So, they come to the erroneous conclusion that they must be really dull to have to put in that much work for the same kind of outcome. To understand the kind of people who experience Impostorism, research has tried to explore its relationship with personality. Studies have shown that those who are low on the personality characteristic of emotional stability tend to experience feelings of Impostorism. This can be explained by the fact that Impostor Phenomenon is characterized by negative emotionalities like the fear of failure (or success), a “workaholic personality" or the fear of being outed as a “fraud". 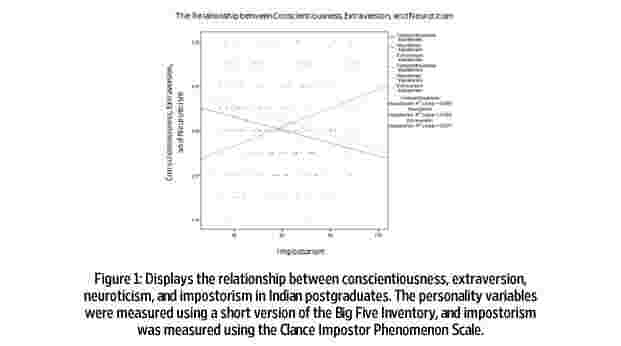 Further, conscientiousness has been found to be inversely related to Impostorism. Those who are conscientious tend to follow norms and rules, and prefer planning, organizing and prioritizing tasks. In short, they are hardworking or persevering. This relationship can be explained by the fact that impostors have a lower self-discipline, in that, they initially procrastinate and then go into a frenzy to complete the task. Furthermore, studies illustrate that both men and women—in different cultures and occupations—tend to report feeling like impostors. To understand this in an Indian context, we collected data from Indian postgraduates studying social science, arts or humanities. Out of the 75 women whose data we analysed, about 8% of them experienced intense impostor feelings often, and about 44% of them experienced it frequently (see figure two). We also found that extraversion, neuroticism (as opposed to emotional stability) and conscientiousness were good predictors of Impostorism (see figure one). More specifically, neuroticism had a direct relationship with Impostorism, while conscientiousness and extraversion had a negative relationship with it. Additionally, we also held a (loosely set) focus group with six postgraduate students to elucidate our quantitative findings. While not all of them attributed most of their successes to luck, participants did say that social support played a major role in their “peak experience with success". That is, when asked to recall an instance where they were definitely successful in an endeavour, and were praised for their efforts, most of them said social support played a significant role in it. While they didn’t attribute their success to luck all the time, when asked if they do feel like impostors sometimes, they mention that “At some point all of us have done [felt] it." What is interesting is how people who feel like they don’t belong in a particular field (“People like me don’t belong in this field", they’d say) also tend to report impostor feelings. For example, academia is mostly thought of as a white male field. Thus, those at the intersection of racial and gender-based discrimination bear the brunt. For instance, one study showed that perception of racial discrimination strengthens feelings of impostorism, which further strengthens feelings of depression and anxiety. Women and minority faculties also are reported as having impostor tendencies, especially if they are from a field where they are traditionally underrepresented (i.e., STEM). It has also been suggested that impostorism may interact with gender and racial discrimination experiences to influence mental health outcomes. Among early career professionals, for example, prevalence of impostor thoughts have significant relationships with depression and anxiety, burnout and psychological distress. Imagine this: you have ticked pretty much all the boxes of professional success, and yet, you are sure that there’s been a mistake. Every morning you wake up and think people are going to tell you, “Of course not, we were just joking. You’re actually not that smart!" Can you imagine if symbols of success were to actually trigger the fears of failure? And yet, this is the reality for many people who you and I think of as successful! If experiences of discrimination lead to feeling inadequate even among successful people, which further leads to mental health issues, surely, we have a long way to go. But then again, those of us who do feel that way can balm ourselves with the knowledge that there are many, many others who experience it, and we are not alone. Like Neil Gaiman said, “If Neil Armstrong felt like an imposter, maybe everyone did. Maybe there weren’t any grown-ups, only people who worked hard and got lucky and were slightly out of their depth, all of us doing the best job we could, which is all we can really hope for." Acknowledgements: I’m grateful to Rhea Pillai and Ritika Gupta who were an integral part of the data collection process. Arathy Puthillam is a research assistant in the department of psychology at Monk Prayogshala, a not-for-profit research organization based in Mumbai, India.